In the rapidly changing world of Intellectual Property Law, street art protection is less commonly discussed than that of other innovative creations. Street art is somewhat ambiguous in its meaning. It is common to associate street art with the graffiti spray-painted tags on a building or subway. However, actual street art is something created with more depth. Legally, the distinction between permanent graffiti and art is permission. Street art becomes vandalism when that permission to publicly paint is not granted. Because of the complexity of public art, the amount of protection warranted to street art is unclear. Graffiti law is not yet a legal practice; however, graffiti-related disputes have been stirring across the country. In a case close to home, 5Pointz graffiti curators have been wrestling with building owners over their famous murals being torn down without notice in Long Island City, New York. 5Pointz, the outdoor art exhibition once praised as an international “graffiti mecca,” is undergoing construction as it transforms into two residential high-rises with luxury apartments. Strikingly, the apartments will keep the 5Pointz name. The newly constructed buildings will showcase street art-style decorations in memory of the destroyed exhibit, much to the dismay of original 5Pointz artists. 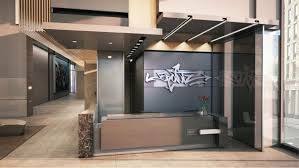 The building may even display replicas of 5Pointz if the artists grant permission. That may be unlikely, though, considering their adversarial stance against the building owners. 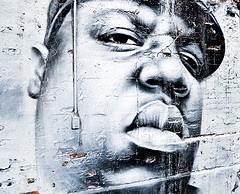 The “RIP wall” at 5Pointz in Queens, NY paid tribute to lost iconic figures, like Notorious B.I.G. The legacy of 5Pointz began with curator Jonathan Cohen in the early 1990s. Nearly three decades ago, the site was merely made up of unused artist studios. So, Cohen asked the building’s owners, Jerry and David Wilkoff, for permission to paint on the walls of the buildings. After agreeing to the artist’s use, Cohen went to work and, over time, local and international artists joined him, turning the buildings into the colorful outdoor art exhibit it came to be known as over time. The building owners were issued a permit on August 21, 2013 by the City Planning Commission to convert the 5Pointz buildings into high rise apartments. On October 10, 2013, Cohen and other aerosol artists sued the owners of the buildings that housed 5Pointz to prevent their works’ destruction, asserting VARA (Visual Artists Rights Act) and common law tort claims in the Eastern District Court of New York. In the case of Cohen, et al. v. G&M Realty, L.P., the court denied the artists’ request for injunctive relief. Despite the suit, the 5Pointz artwork were quickly whitewashed in one night, erasing all artwork to allegedly prevent the property from being able to claim landmark status. The artists accused the owners of deliberately whitewashing the art so rapidly in an attempt to sabotage their plan to get the building landmarked because they had already prepared over 20,000 landmark forms for submission to the Landmarks Commission that were collected during a rally several days before the destruction. The stigma behind graffiti being an act of vandalism is blurred when building owners consent to having street art on their property, and then forcefully remove it without giving the artists an opportunity to preserve their work. Twenty-three artists had accused Jerry Wilkoff of removing the murals without giving the artists a fair opportunity to remove and preserve their work, or even the minimum notice required by law. In March 31, 2017, Senior District Judge Frederic Block ruled against the real estate developers, who made a motion to dismiss the artists’ third and final complaint. Judge Bloc stated that: “For VARA, the plaintiffs would have no right to prevent 5Pointz’s destruction by its rightful and legal owner; hence, the plaintiffs’ “moral rights” to prevent another’s disposition of his property arise purely under VARA. Because the plaintiffs’ conversion and property damage claims wholly depend on the viability of their VARA claim, the Court finds them to be fully preempted.” This significant legal victory for the artists is meaningful for the entire art community because the judge is allowing the case to go in front of a jury who may be more sympathetic to the wronged artists than to the real estate owners and developers. (1) a painting, drawing, print, or sculpture, existing in a single copy, in a limited edition of 200 copies or fewer that are signed and consecutively numbered by the author, or, in the case of a sculpture, in multiple cast, carved, or fabricated sculptures of 200 or fewer that are consecutively numbered by the author and bear the signature or other identifying mark of the author. Only the author of a work of visual art has the rights conferred by subsection (a) in that work, whether or not the author is the copyright owner. The authors of a joint work of visual art are co-owners of the rights conferred by subsection (a) in that work. Interestingly, real estate and copyright law seem to intersect where VARA applies, and so real estate owners, like those of the 5Pointz site, need to be aware of its protections. Title 17 of the United States Code, Section 106A(a)(1)(B)(3)(A) provides that the author of a visual art has the right to prevent intentional mutilation of a work, and any such mutilation is a violation of that right. Undoubtedly, the developers have violated the artists’ VARA-granted right. None of the statutory exceptions apply to the developers. The works were not naturally distorted over time or modified for improvement. Furthermore, 5Pointz comprised of original visual works based on each artist’s own perception; they were not reproductions or depictions of other works, so the third exception does not apply either. VARA grants visual artists these rights for the duration of the artist’s life, unless that right has been waived in a written instrument and signed by the artist, and there is no evidence of such waiver by the artists here. While some perceived Judge Block’s ruling against the developers as an “unexpected turn” for the graffiti artists, it’s almost clear-cut that VARA is written in the artists’ favor. 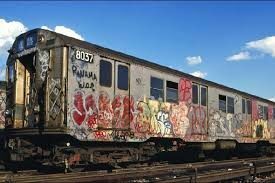 Despite the undefined realm of graffiti law, VARA is not so ambiguous as to the protections it warrants; nonetheless, it is narrowly construed. With the support of articles on 5Pointz, corporate and worldwide recognition, and “aerosol art” experts’ testimonies, it seems quite feasible that a jury will sympathize with the 5Pointz artists who, with the permission of the owners, worked on the demolished buildings. In the meantime, the art world awaits and anticipates the trial that turn out to be a landmark case for street artists in need of protection for their recognized works. Nicole Martinez, Street Art or Vandalism? Art Law Journal (2017). Marie-Andree Weiss, “Spray” the Word: Graffiti Law is a New Legal Niche, The 1709 Blog (2016), http://the1709blog.blogspot.com/2016/11/spray-word-graffiti-law-is-new-legal.html (last visited Aug. 4, 2017). Claire Voon, A Glimpse Inside the Street Art–Themed 5Pointz Condos, Hyperallergic (2017), https://hyperallergic.com/386244/a-glimpse-inside-the-street-art-themed-5pointz-condos (last visited Aug. 4, 2017). Corey Kilgannon, 5Pointz Graffiti Artists Whose Works Were Erased Will Get Day in Court, The New York Times (2017), https://www.nytimes.com/2017/04/09/nyregion/5pointz-graffiti-artists-whose-works-were-erased-will-get-day-in-court.html (last visited Aug. 4, 2017). Bruce Wallace, Remembering 5Pointz: A Five-Story Building That Told Plenty More, NPR (2013), http://www.npr.org/2013/11/21/246549375/remembering-5pointz-a-five-story-building-that-told-plenty-more (last visited Aug. 4, 2017). Jessica Meiselman, 5 Pointz Graffiti Artists Score Major Win in Suit against Developers, Artsy (2017), https://www.artsy.net/article/artsy-editorial-5-pointz-graffiti-artists-score-major-win-suit-developers (last visited Aug. 4, 2017). Leonard Greene, Two high-rise towers will pay homage to graffiti mecca 5Pointz, NY Daily News (2017), http://www.nydailynews.com/new-york/high-rise-towers-pay-homage-graffiti-mecca-5pointz-article-1.3207741 (last visited Aug. 4, 2017). See Cohen v. G & M Realty L.P., 988 F. Supp. 2d 212 (E.D.N.Y. 2013). Laurel Babcock & Bob Fredericks, Graffiti mecca 5 Pointz erased overnight, New York Post (2013), http://nypost.com/2013/11/19/5-pointz-graffiti-erased-in-overnight-paint-job/ (last visited Aug. 4, 2017). Cohen v. G&M REALTY LP, Case No. 13-CV-05612 (FB) (RLM) (E.D.N.Y. Mar. 31, 2017), https://scholar.google.com/scholar_case?case=13462150384806350539&q=COHEN+V.+G%26M+REALTY+L.P.&hl=en&as_sdt=3,33&as_vis=1 (last visited Aug 24, 2017). Cohen v. G&M REALTY LP, Case No. 13-CV-05612 (FB) (RLM) (E.D.N.Y. Mar. 31, 2017), https://scholar.google.com/scholar_case?case=13462150384806350539&q=COHEN+V.+G%26M+REALTY+L.P.&hl=en&as_sdt=3,33&as_vis=1 (last visited Aug. 24, 2017). See 17 U.S.C. § 101 (1994). 9 Comments on "Graffiti: Legal or Illegal?" I think it could be argued that the phrase “…inherent nature of the materials…” could be applied to the reasonable assumption that the walls of dilapidated buildings are by their inherent nature a temporary “canvas” and should be reasonably expected to be painted over and/or torn down. For the record, I love the art, but disagree with the artists on this issue for several reasons, not the least of which is the potential chilling effect on future permission by building owners. What are the consequences moving forward for real estate developers who violate VARA? Does the artist receive compensation for someone destroying their mural without consent? Does the one who destroys the mural spend time doing community service? Where is the part where the developers are held accountable?